The title may be an exaggeration, but it sure feels like the truth this year. Don’t get me wrong, I’m actually all in favor of a well watered growing season, but this endless gloom is really wearing me down this year. Fortunately the colder weather seems to have dried the air out a bit and although there are still plenty of storm systems creeping across the States it’s only tomorrow which seems to be a complete wash-out. With that on the way I made a point of taking advantage of yesterday’s dry skies and sunny weather (and a Christmas holiday!) to labour outside a bit, and hopefully work off a few cookie-calories. 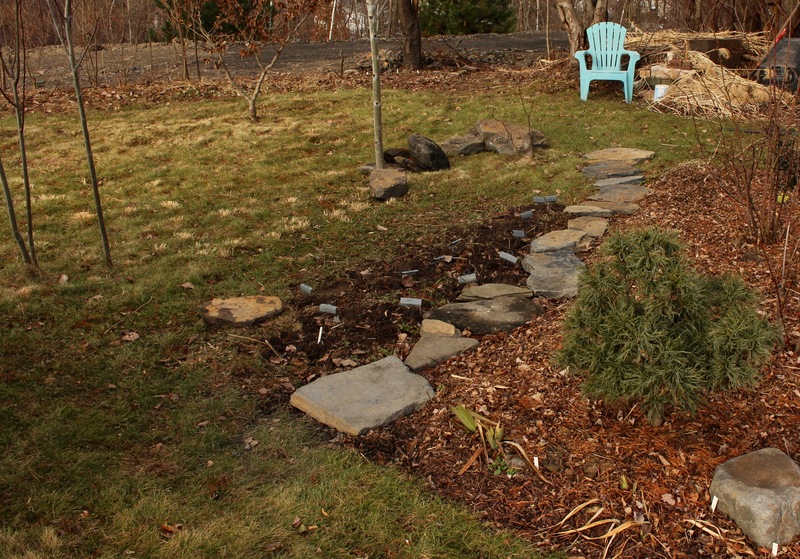 Stones were hauled out of the construction site next door and put to use in expanding a planting bed. The hard work was hauling stones. 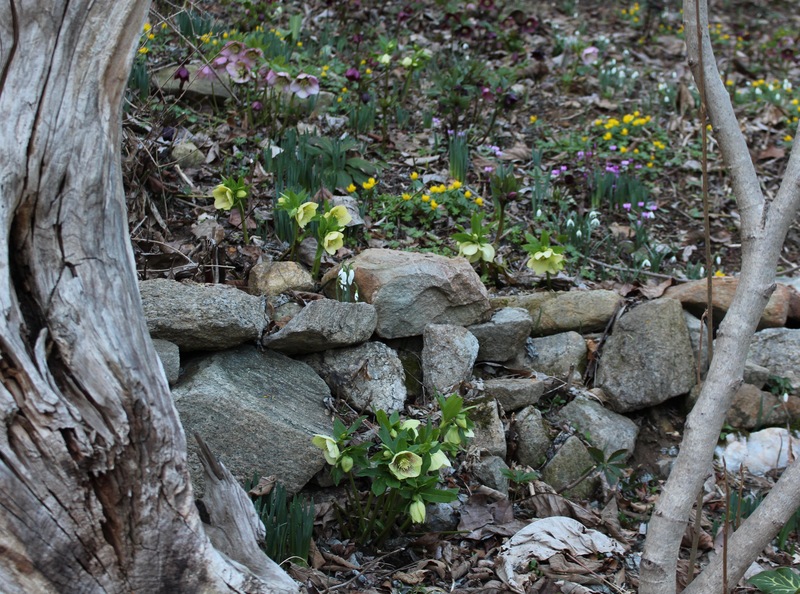 For those who garden on rocky mountainsides the idea of intentionally adding rocks to a yard might seem like nonsense but I love having them scattered around. Big enough to sit on is perfect, flat enough to step on is also good enough. This line of stepping stones will hopefully be ideal for muddy spring mornings spent looking too closely at sprouting snowdrops. 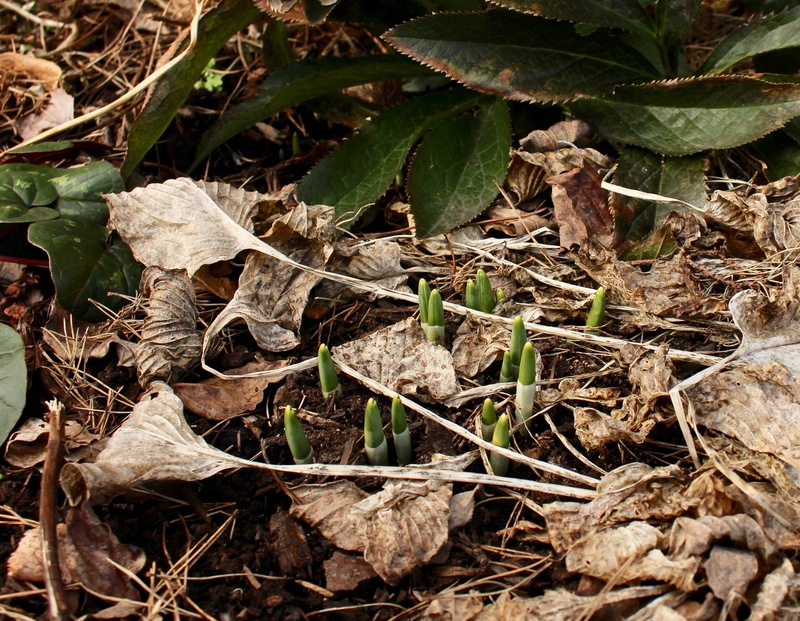 Speaking of snowdrops here are a few of the earliest sprouts. 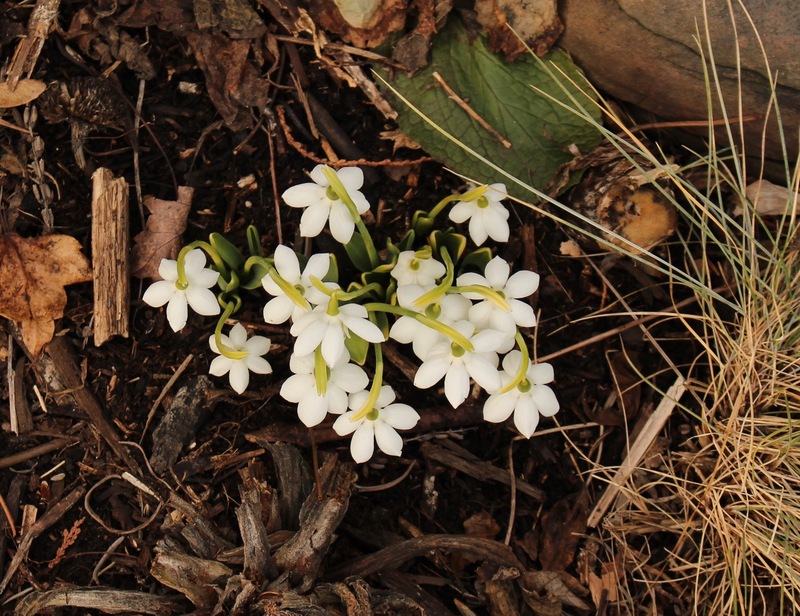 Depending on how the winter goes we could have blooms coming on these by January, February, or March…. Earlier sounds nice, but the stress of later, damaging cold snaps is sometimes not worth it. Even with a little sunshine, most everything is the garden is dull and bleak ‘winter interest’, and I guess if you’re taking a winter vow of poverty that’s fine but I prefer to see a little more interesting in my winter interest. 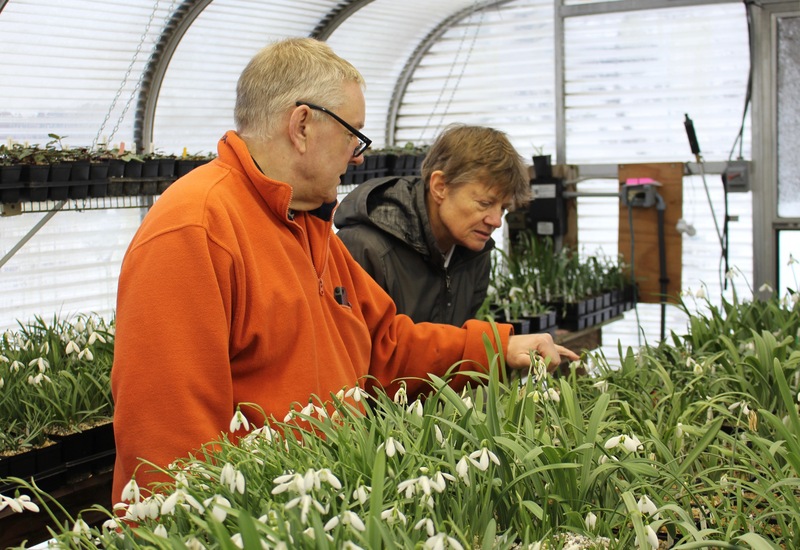 A move further south is out of the question, a massive greenhouse is out of the budget, but maybe a few fall blooming snowdrops will fit the bill. This summer I finally planted my ‘Potter’s Prelude’ out in the open garden, and will now see how they take a full blown, in the garden winter. Many have re-assured me they’ll be fine, but for now I’m committed to covering them ever time the weather sinks into the low 20’s. 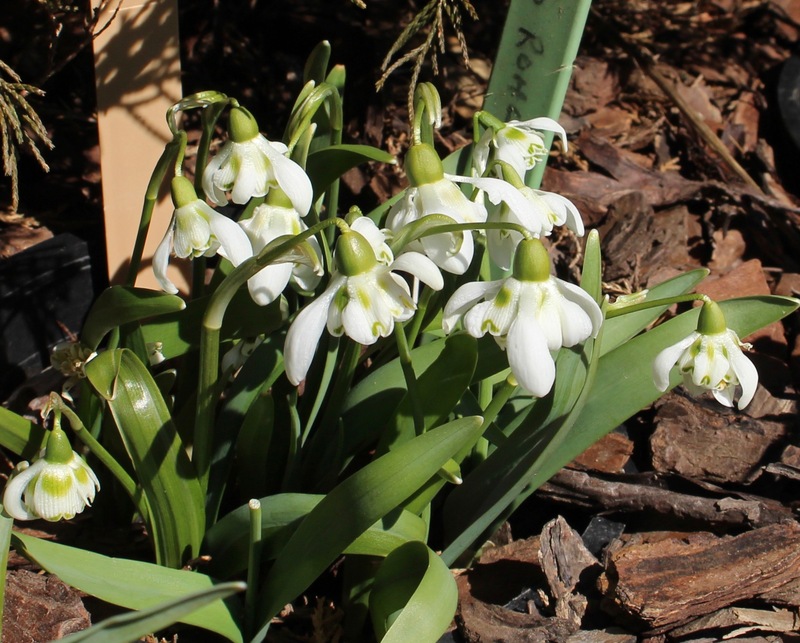 Galanthus ‘Potters Prelude’. This year they’re about a month late, undoubtedly I wasn’t the only one waiting for all the rain to stop. We will see if much else still gets done during these lulls in winter. I tried to warm up to the winter garden in the garage last week but maybe it’s still just too early and I’m still not quite as desperate as I will be when the snow flies, so for now I’ll still putter around outside. In the meantime I hope the holidays are being enjoyed by all. The countdown to 2019 has begun and I wish all of you nothing but the best for the new year! 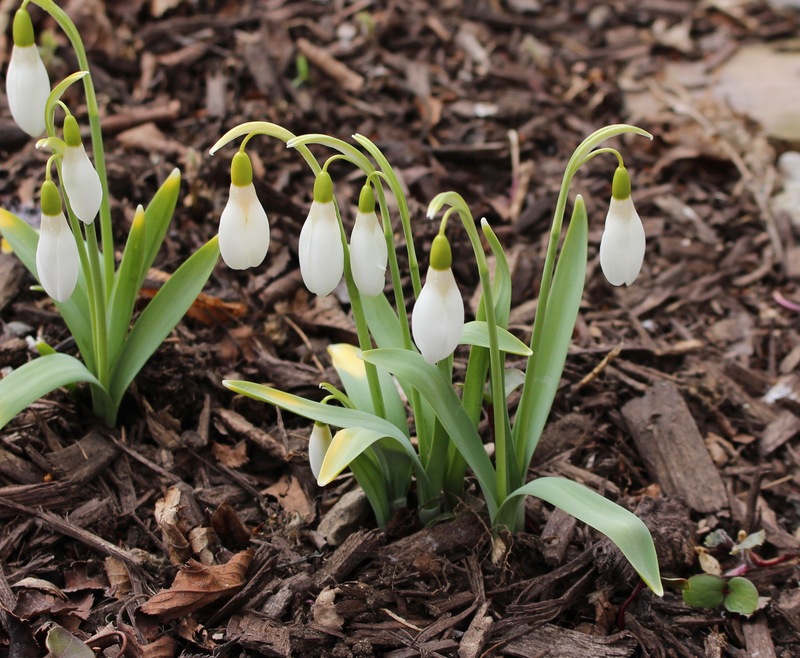 Four snowdrop gardens in one beautiful day was a little too much. We started early, had a tight schedule, but even with the best intentions still didn’t have nearly enough time. It was still a thrill though, and with brilliant sunshine combined with comfortable sweater weather we really enjoyed our annual Philly drop adventure. 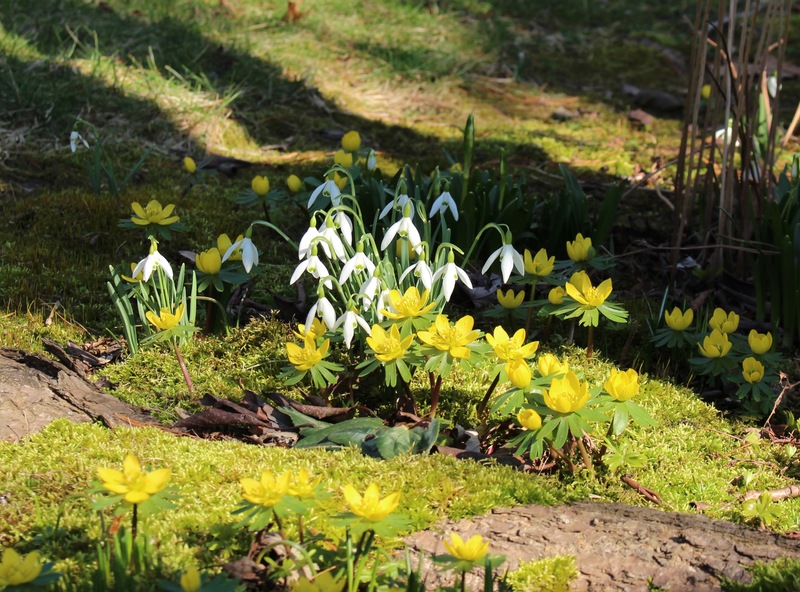 The common snowdrop (Galanthus nivalis) plus winter aconite (Eranthis hemelis) in the rooty, mossy shade of a large cherry tree. We started at Paula’s and I couldn’t resist checking up on nearly every drop she has. Of course that takes time since you don’t just look and move on, you instead admire it, ask where it’s from, how it’s doing… to keep a long story short you’ll be relieved to know this is the ‘executive post’ and you’ll be spared from at least 99% of our comments and 99.9% of my photos. You can thank me later. 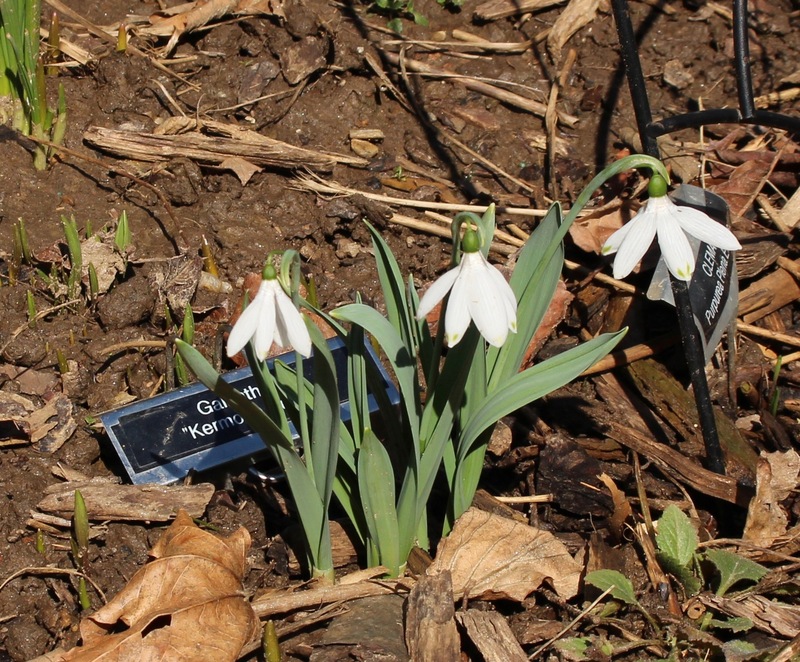 Galanthus ‘Kermode Bear’. One of the ‘bears’ coming out of Canada, an attractive ‘poc’ elwesii with six nice long outers and none of the usual shorter inners. I did have to show ‘Kermode Bear’. He’s a newer snowdrop out of the breeding work of Calvor P. in Victoria Canada. 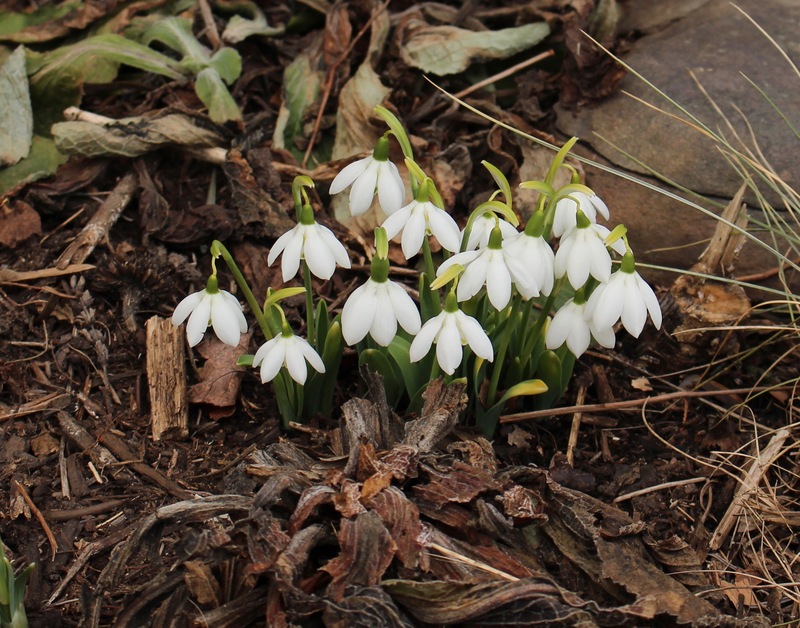 All the Bears are poculiform elwesii which means they’re these nice, large snowdrops with ‘poc’ flowers… meaning the three normally short inner petals are expanded to be nearly as large as the three outers. I’m a fan, just as I was a fan of many of Paula’s other drops, but the clock was ticking and we were already an hour off schedule by the time we arrived at our second garden. 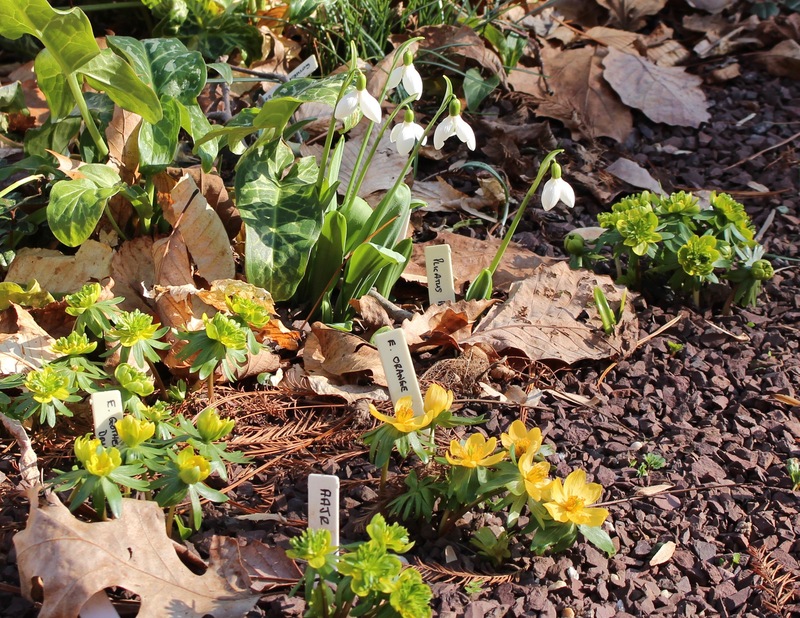 Sloped beds covered with sheets of snowdrops and winter aconite. 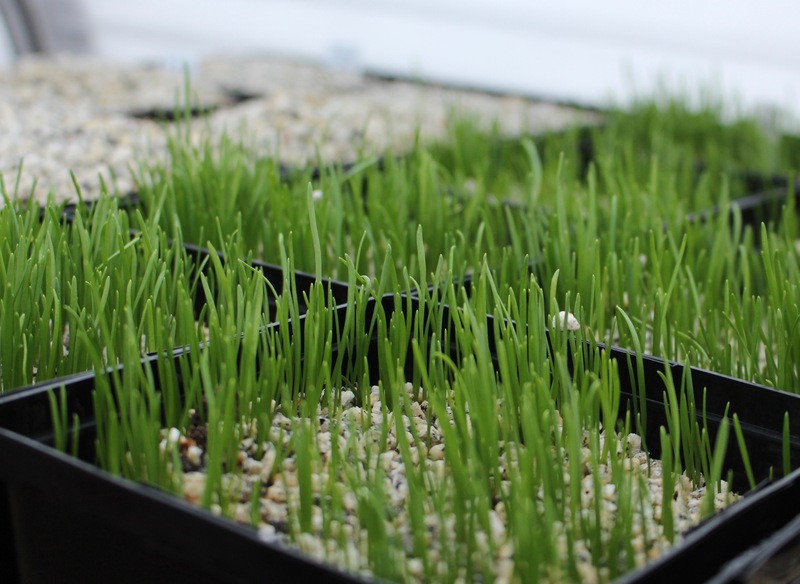 Hard to imagine this gardener began with an empty field and a few gifted clumps. 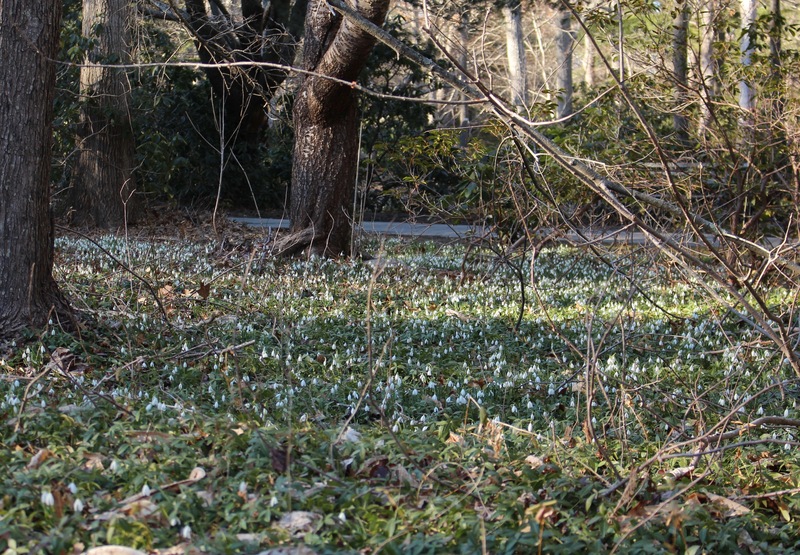 There were masses of snowdrops at our next garden. Dozens of years of dividing and transplanting the original clumps can lead to amazing things, and we hit it at the exactly the right moment. 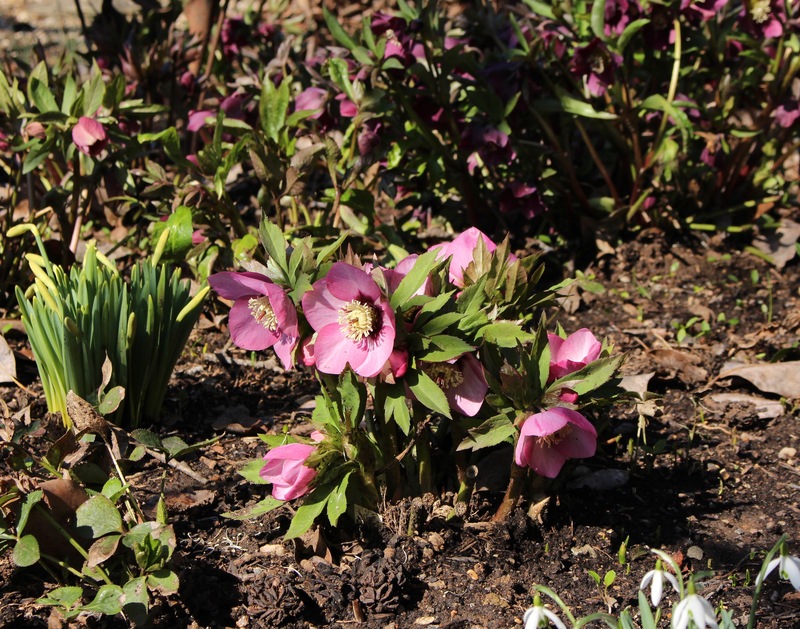 The February sunshine and warm temperatures had everything up and open, including the first hellebores. An amazing newer hellebore with huge flowers, clear rose with a darker center, and flowers facing out and up. It was even nicer in person! Again, I’m leaving out so many hellebore and snowdrop closeups it’s practically negligence, but I don’t want to cause too much suffering for those who don’t have quite as much tolerance or enthusiasm as we do. Here’s a quick image to give you an idea of just how elaborate the rest of the grounds are. 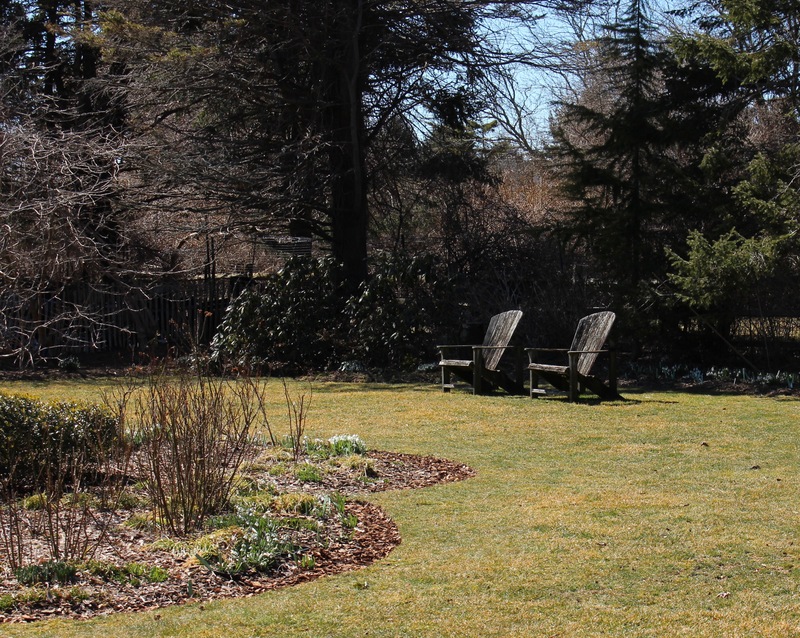 It was intimidating to think of what a force of nature this gardener must be, considering she does all the maintenance herself and has been doing so for several decades now. Inspiring is probably a better description. 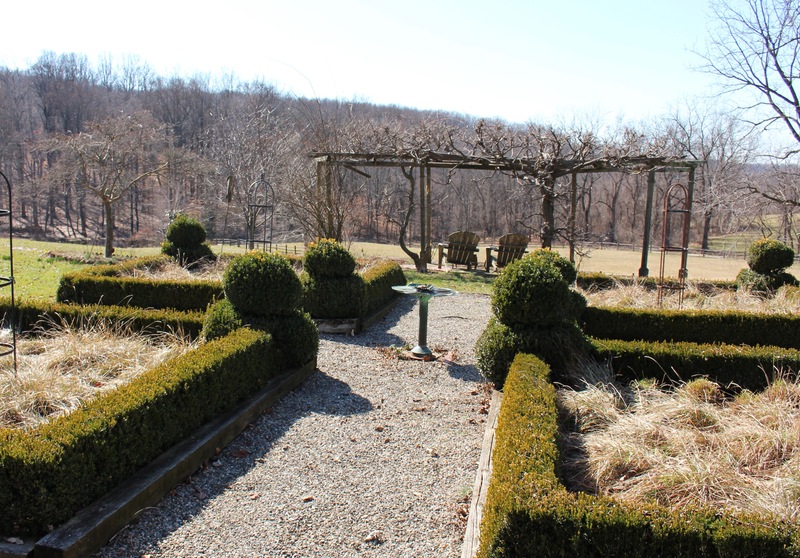 A parterre off the house overlooking the open fields. The homeowner admitted she was still in the process of trimming back the grasses. I’m embarrassed to say mine look worse. I’m afraid we overstayed our welcome, but our host was still remarkably gracious, and although we tried to hurry on our way the schedule still suffered further. The light was getting lower by the time we reached our third garden, the home of the King of Cyclamen (in the US at least), Dr. John Lonsdale. 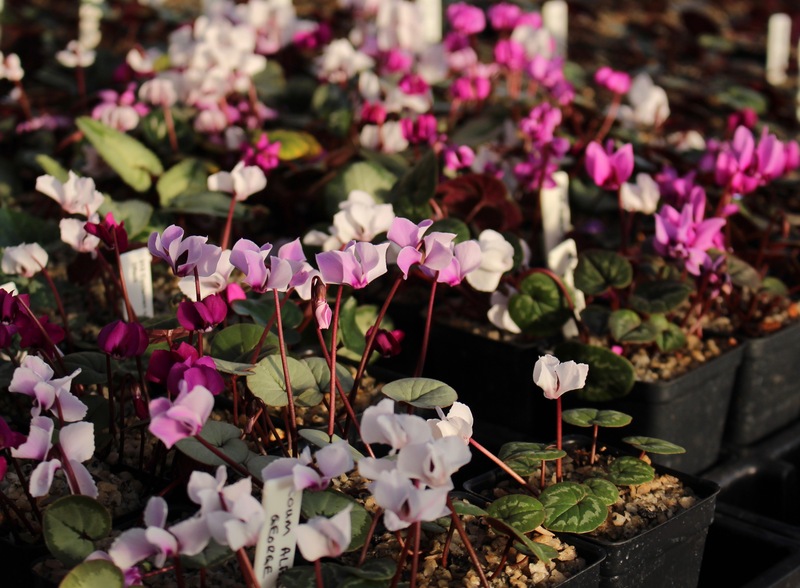 Cyclamen coum in the greenhouse. 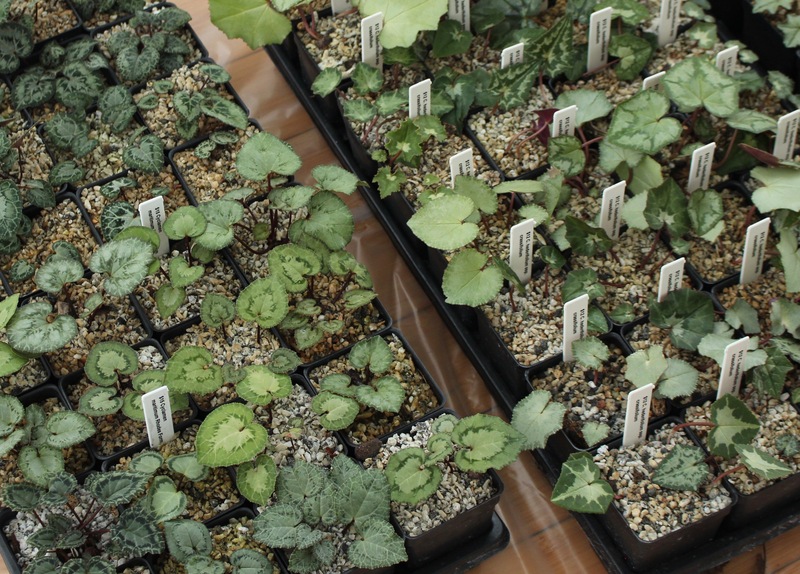 They’re perfectly hardy outdoors but these are all potted up and ready to go on a roadtrip to the next specialty plant sale. John tolerates us very well. We’re always late, we always stay too long, and we always ask way too many questions, and I can’t imagine our plant purchases and gifts of beer make up for the time we waste, but he’s yet to kick us out and so far he hasn’t put us to work. Probably for the best of course, since I’m not sure we could be trusted with a weeder or trowel around so many treasures. 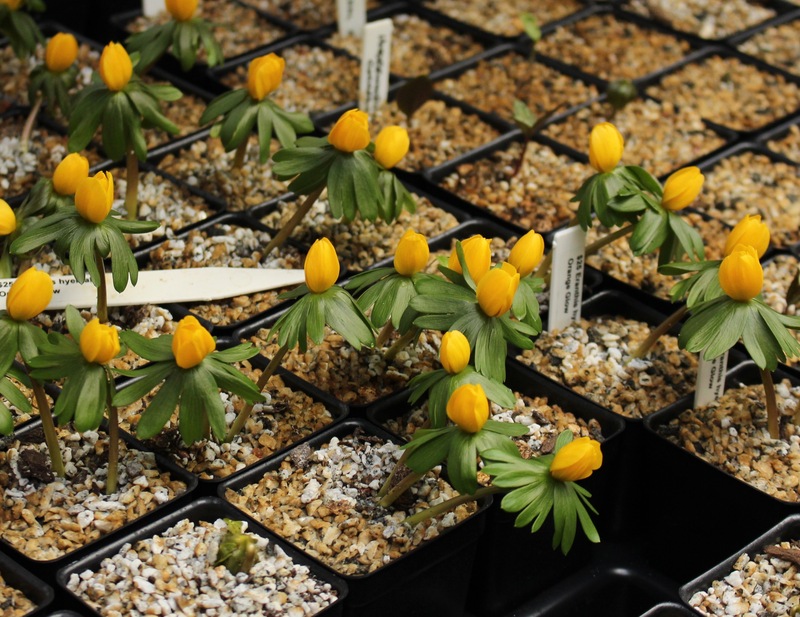 Snowdrops and several varieties of winter aconite (Eranthis hyemalis). 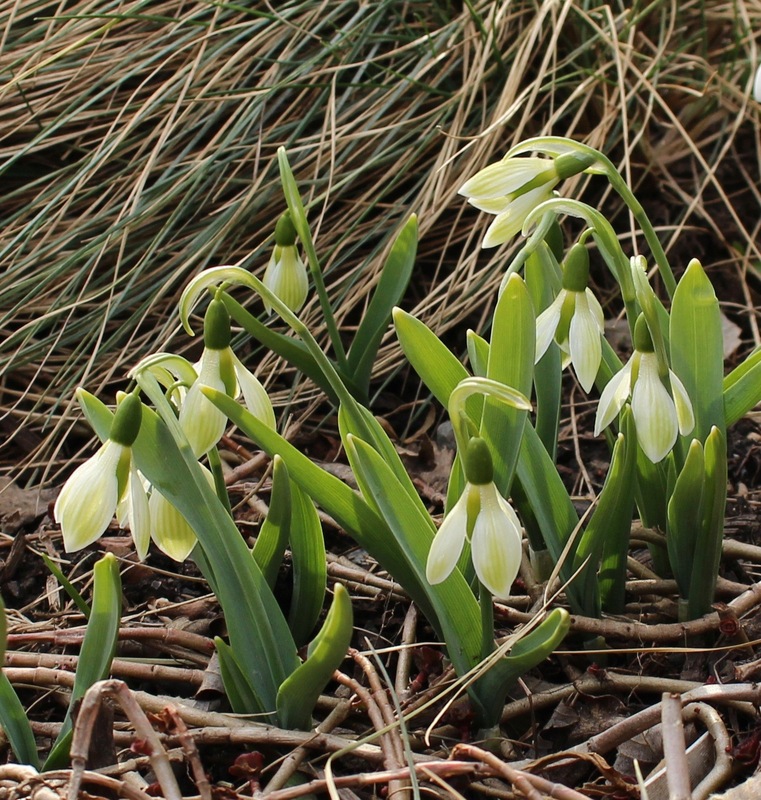 Galanthus nivalis ‘Elsje Mitchell’. 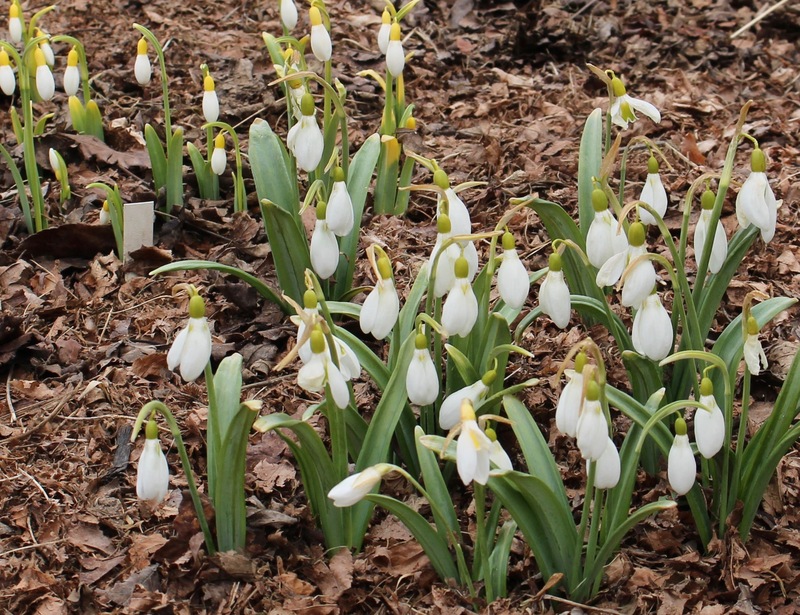 A delicate Dutch snowdrop with fine markings both inside and out. The sun was much lower by the time we started to make our way out to the car. 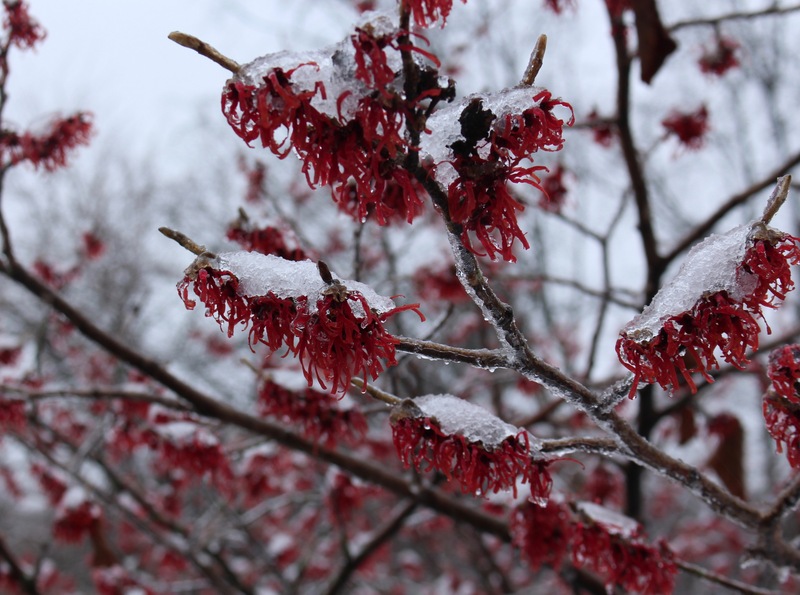 It was beautiful to see the witch hazel flowers glow in the low sunshine but sad to consider we were running out of time. One more garden though. There’s never enough time to really check out the hardy cactus, yucca, and agaves which fill the side yard. The light through the spines was amazing. We got to our last garden as the light was fading and temperatures were beginning to drop. 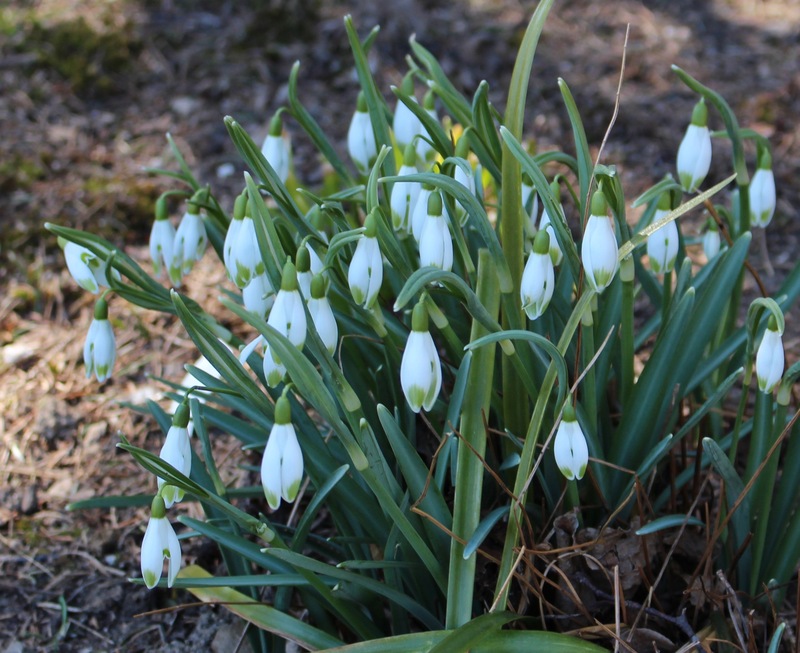 The snowdrops were closing up for the night and I believe our host had almost given up on us ever getting there, but was still incredibly enthusiastic and accommodating in spite of the unreliability of his visitors. 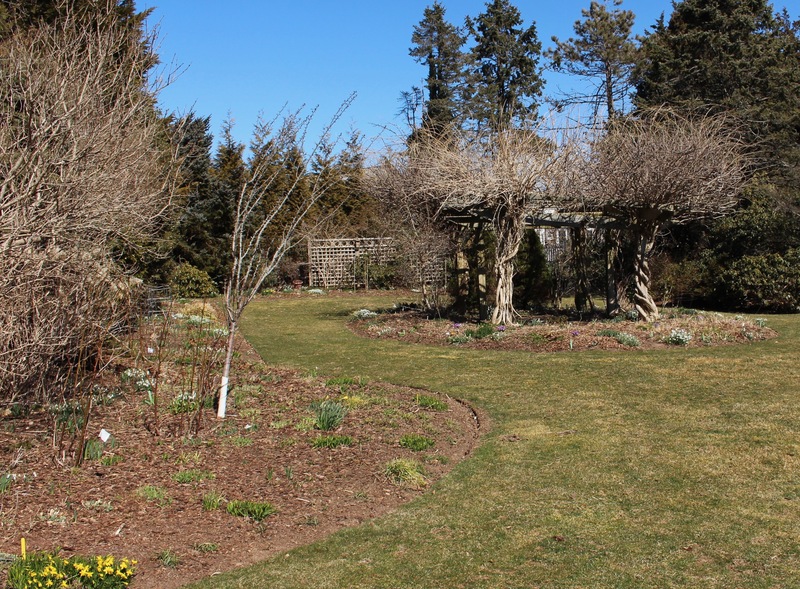 A beautiful garden filled with layers of snowdrops and hellebores, witch hazels and dogwoods, and a tall canopy of deciduous trees. The light was fading and even though this garden also has masses of early spring bulbs and carefully designed vignettes there were far too many distracting snowdrops and interesting garden stories to pay attention to. I love going here and could have easily spent another hour or two poking around. I will spare you most of the rest of my dimly lit photos and leave you with just two more particularly wonderful scenes. 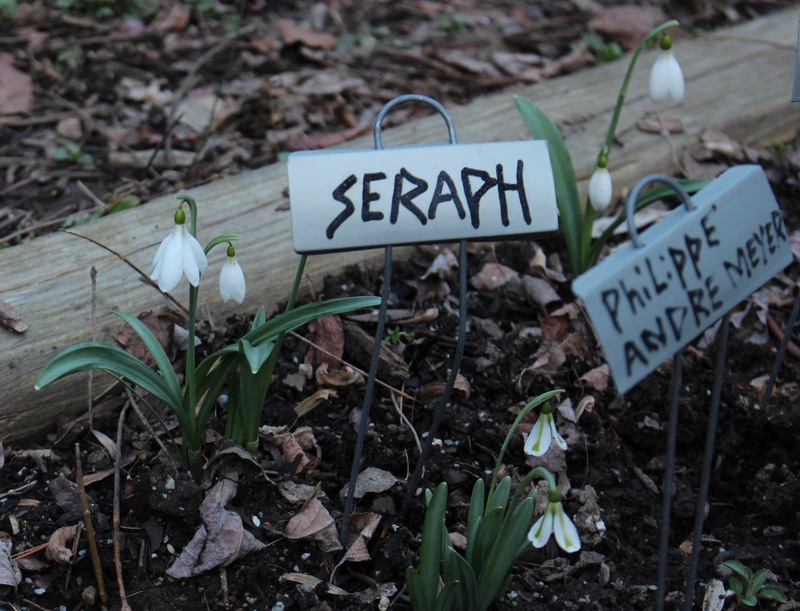 Galanthus ‘Seraph’ and ‘Philippe Andre Meyer’ in the protected nursery beds. 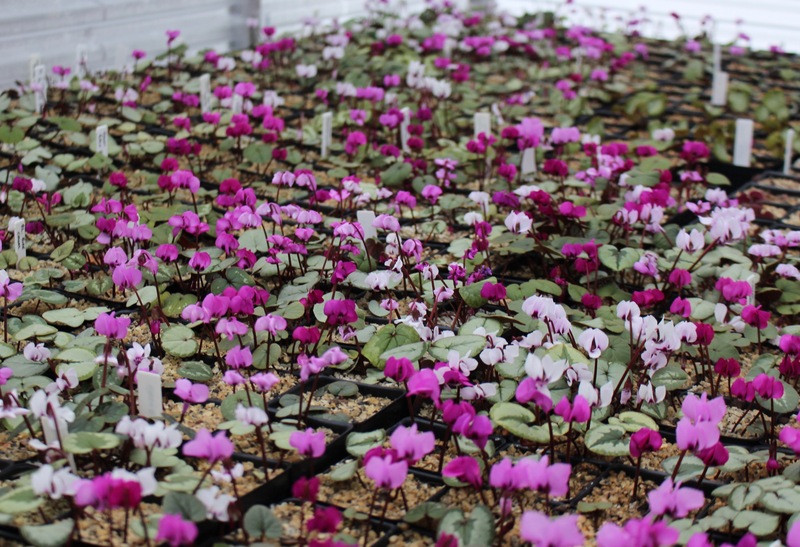 Before the most special drops go out into the open garden this gardener bulks them up in one of several nursery beds. 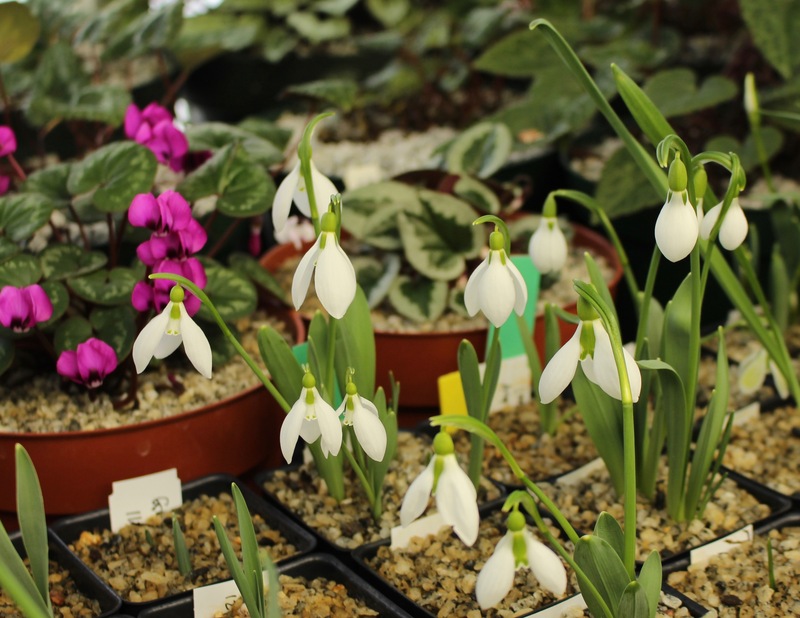 There were a number of treasures such as galanthus ‘Seraph’, “Philippe Andre Meyer’, and ‘Matt Bishop’ plus many, many others. 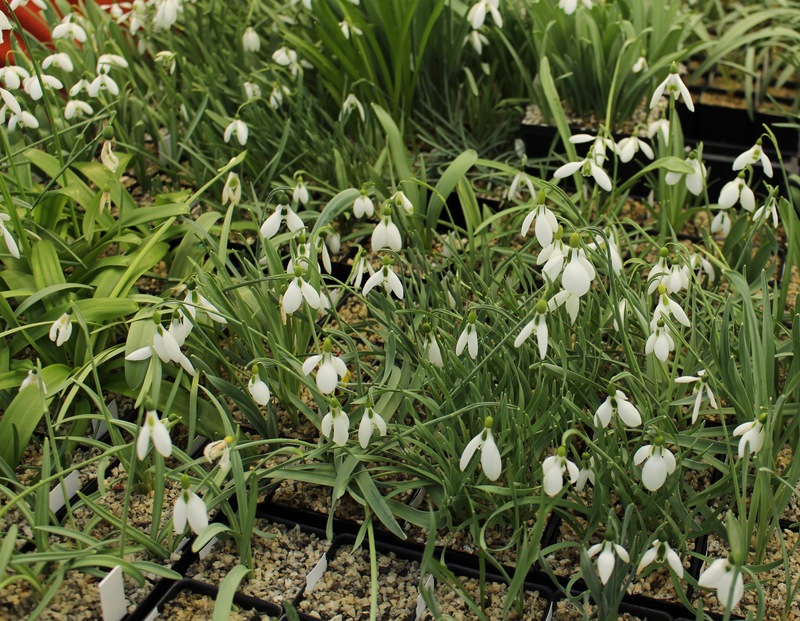 Some people are really nuts about snowdrops. With this in mind I’ll leave you with one last drop who’s name really seemed appropriate for our adventure. 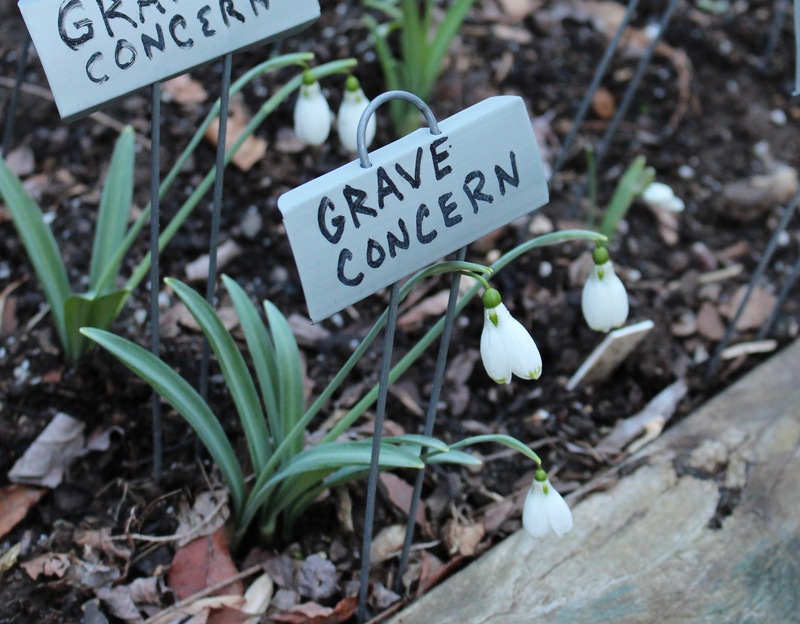 I believe Galanthus ‘Grave Concern’ was discovered in a cemetery, but considering how much my wanted list grew on this trip I think it’s a perfect name to end this post on. If you’ve made it this far I thank you, just as I thank the wonderful people who allowed us to tie up their schedules for as long as we did. On top of that I’d also like to point out that this upcoming week is just filled with a bonanza of other Philadelphia PA snowdropping events which amazingly coincide with the peak of this year’s season. 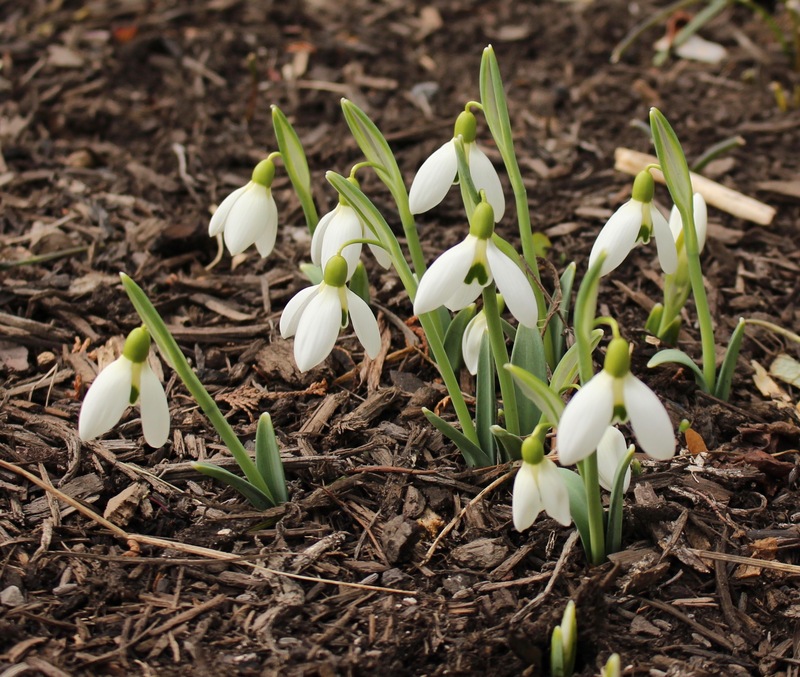 Here’s a quick rundown starting out with my most anticipted event, the >second annual Galanthus Gala< this Saturday (March 3rd) in Downingtown PA. 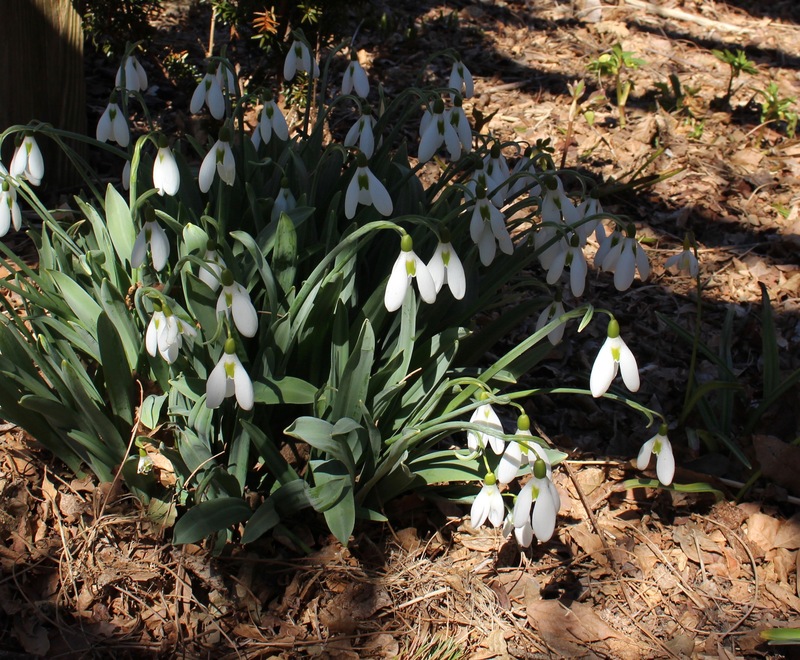 This celebration of snowdrops and other late winter flowers and shrubs is hosted by the plantsman, author and designer David Culp, and promises to be a wealth of plants, talks, sales, and all things snowdrop on this side of the Atlantic. Free admission is a plus, but I challenge you to walk out again without some little treasure in your hands. 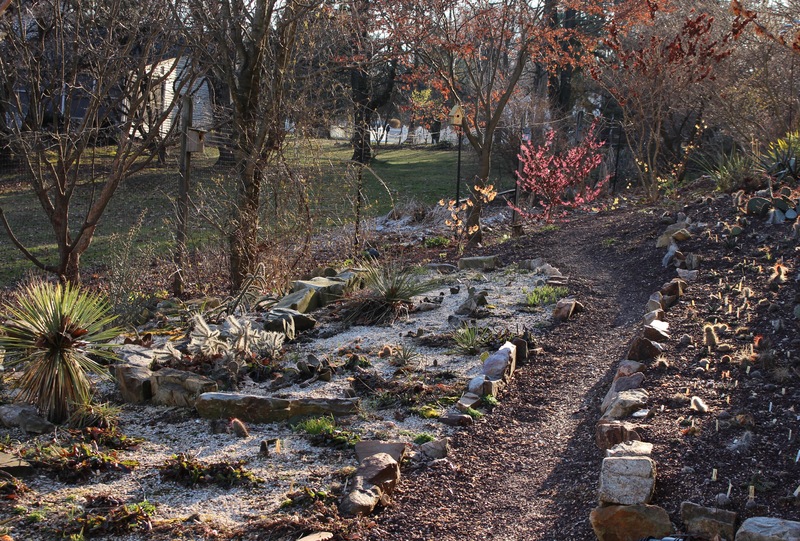 You might also want to consider stopping by >Carolyn’s Shade Gardens< in Bryn Mawr PA. It’s about 35 minutes away from the Gala location and word is Carolyn is hosting an open garden Saturday, March 3, from 1:30 to 5 pm, and Sunday, March 4, from 1 to 4 pm. 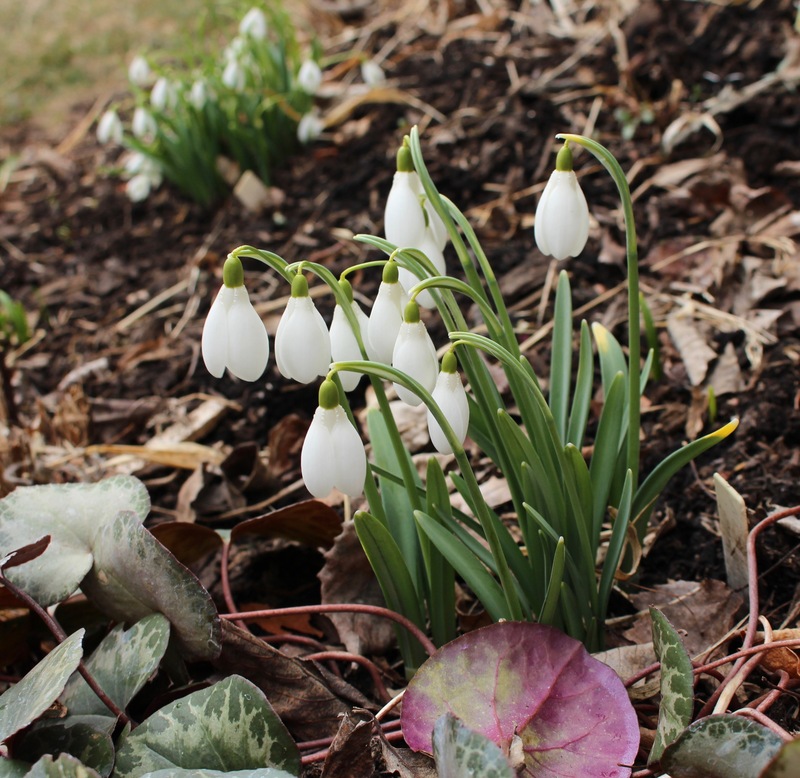 Snowdrops and hellebores in full bloom plus plants available for sale. 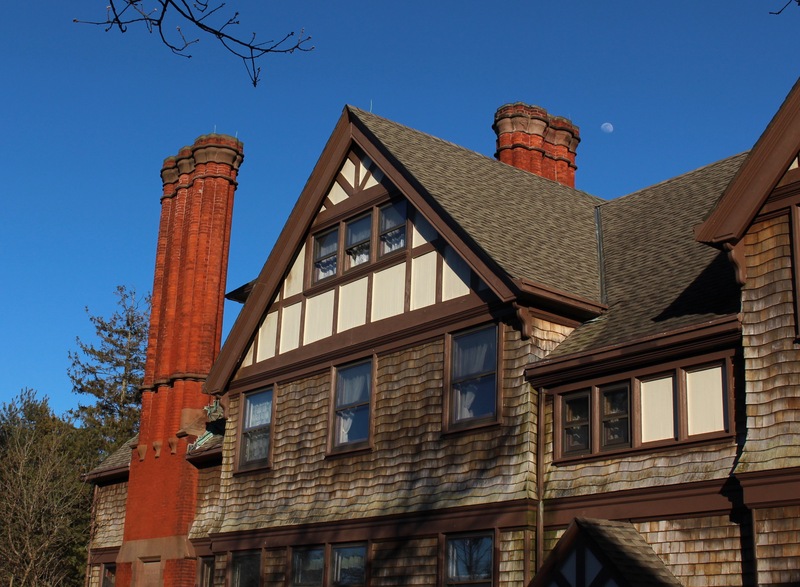 The address is 325 South Roberts Road, Bryn Mawr, PA 19010, 610-525-4664. 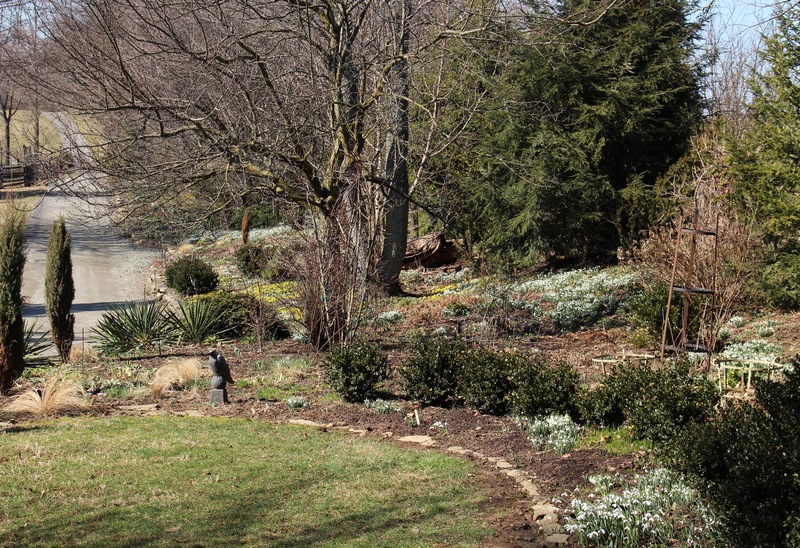 If that isn’t enough, the >Philadelphia flower show< also kicks off this weekend and runs through the week, and to cap it all off >Winterthur Museum and Gardens< will be holding their annual ‘Bank to Bend’ lecture and plant sale on Saturday, March 10th. 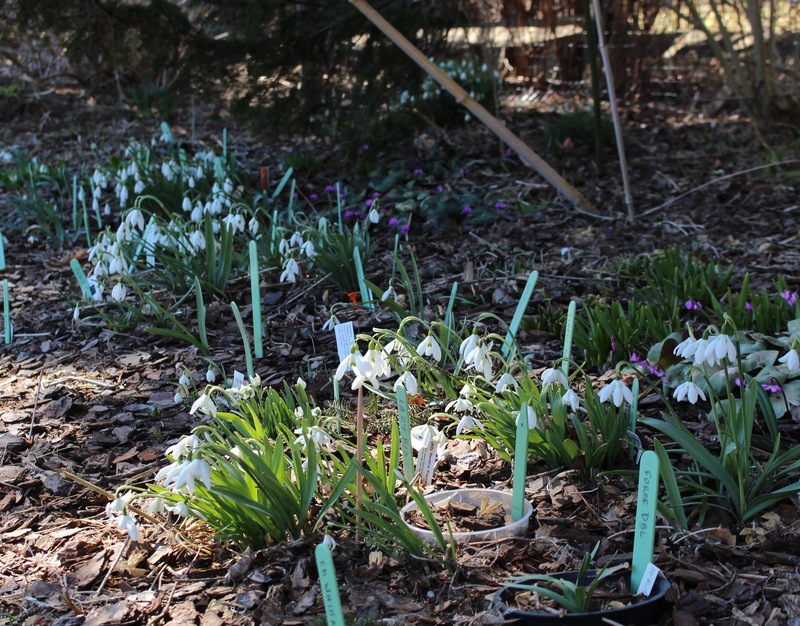 The grounds should be perfectly full of snowdrops snd other spring bloomers, and the lecture by Dr. Peter Zale promises to be exceptional. The season looks like it’s off to a good start, and as long as we survive this last burst of winter I think we’ll be in good shape. Have a great weekend! February seems to be on its way to becoming the new March with the way these warm spells sneak in. Today the afternoon high hit 75F (24C) and it was actually a bit unsettling to break a sweat in the garden knowing that the thermometer will drop down to freezing within the next few hours. That could have been a serious concern, but obviously my thoughts on global warming vanished the minute I saw how much the snowdrops had come along. I spent the entire afternoon trimming things, poking around for shoots, and admiring the early birds which had already come into bloom. 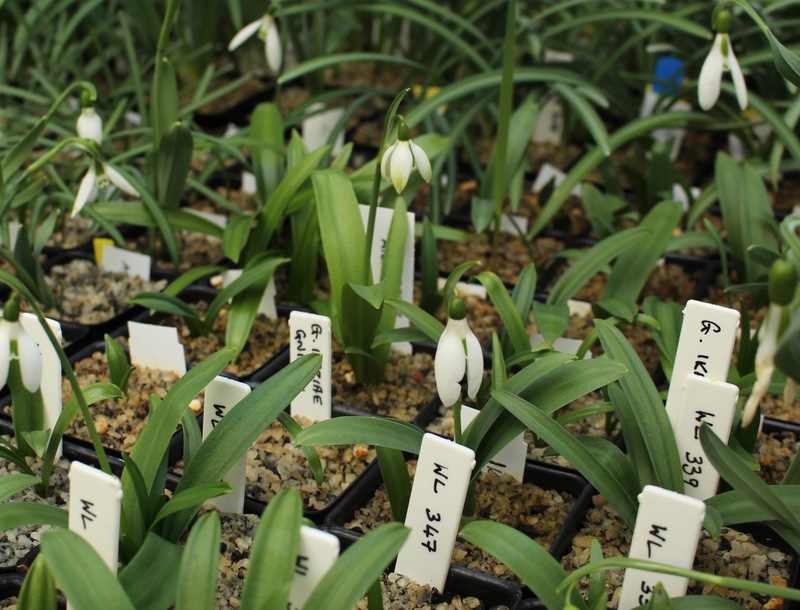 Galanthus elwesii, the giant snowdrop. One of the earliest to rear its head in my garden. 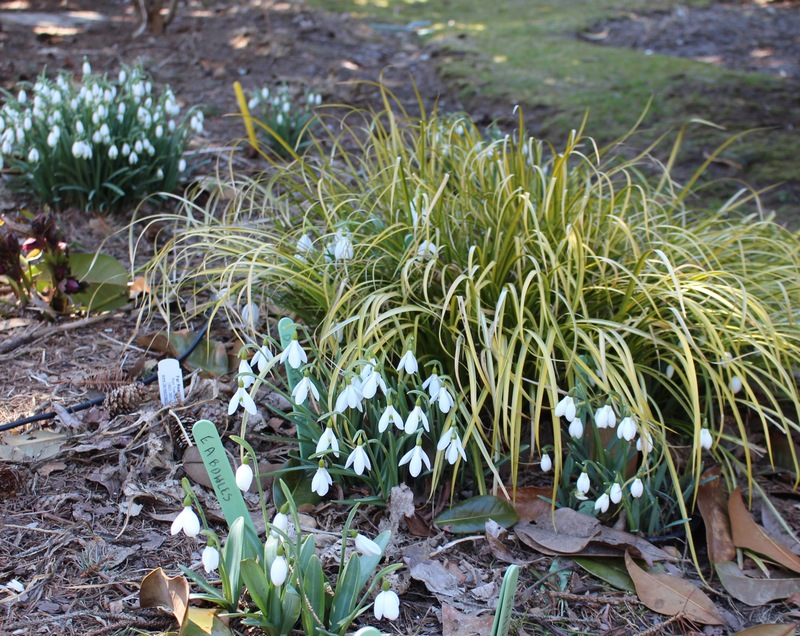 There are a lot of snowdrop favorites in this garden and one near the top is Galanthus ‘Godfrey Owen’. 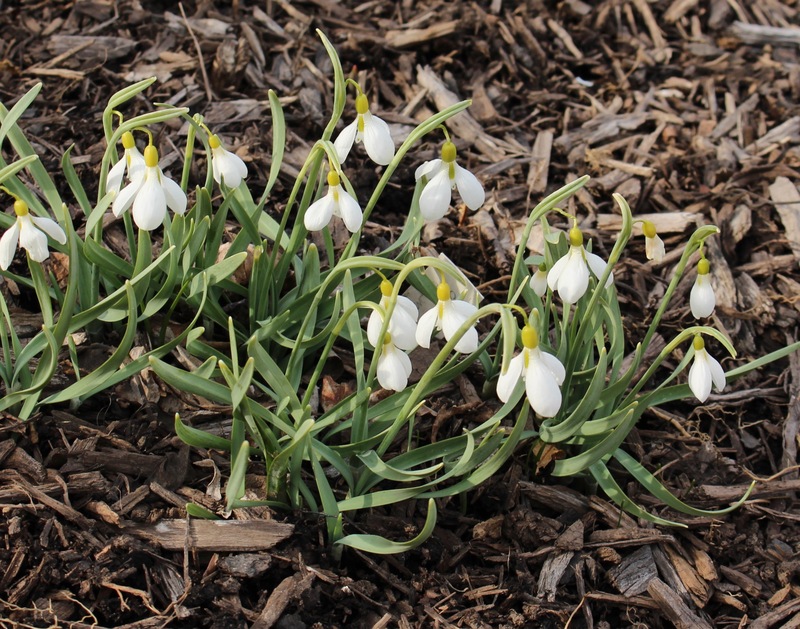 He’s a handsome snowdrop, and of course he’s looking exceptional this spring. 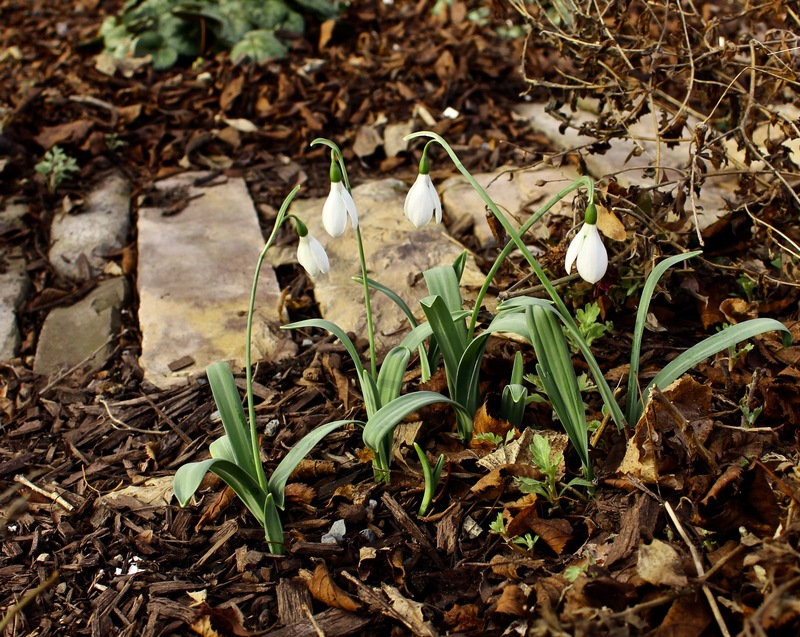 Galanthus ‘Godfrey Owen’, rising up fresh and clean amongst the winter wreckage of last season. 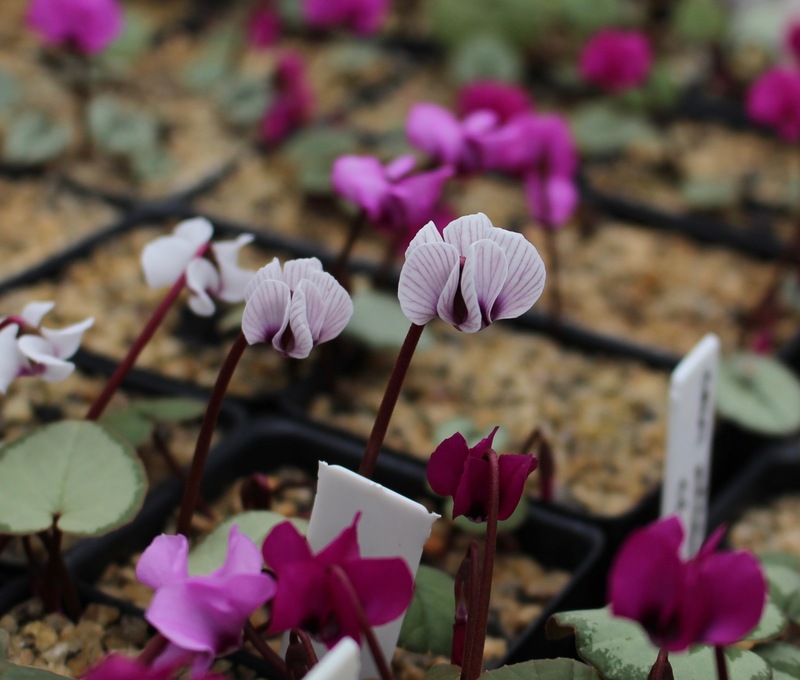 Godfrey is special for his doubled outer petals which make a brilliant star when fully open and looked at from above… this is how most sane people admire these tiny little late winter flowers. 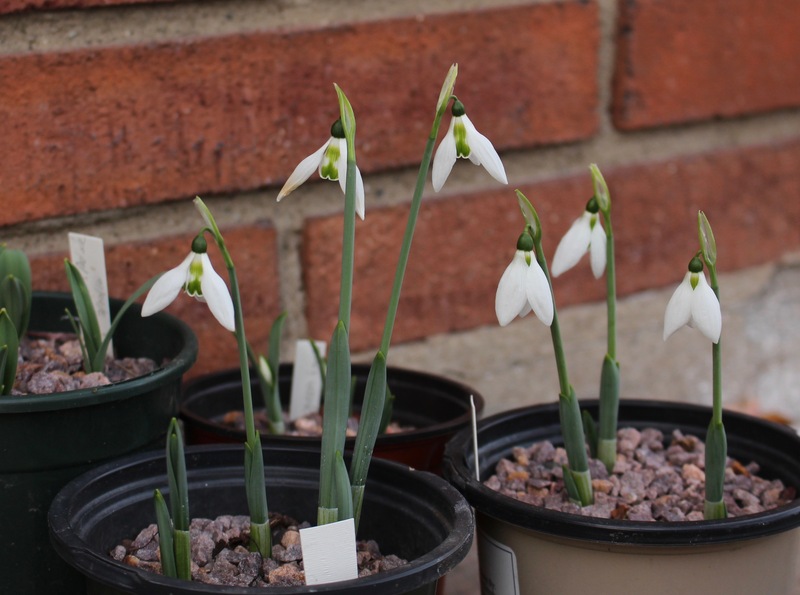 Another snowdrop which also shows some variation from the standard three outer petals, three inners, is ‘Natalie Garton’. She’s a new one to the garden this spring but I wanted to show the interesting inner ‘extras’ which hang down from the middle of some of the flowers. New is always special, so we’ll have to wait for time to tell if this strange inner remains just interesting or slowly becomes a classic. 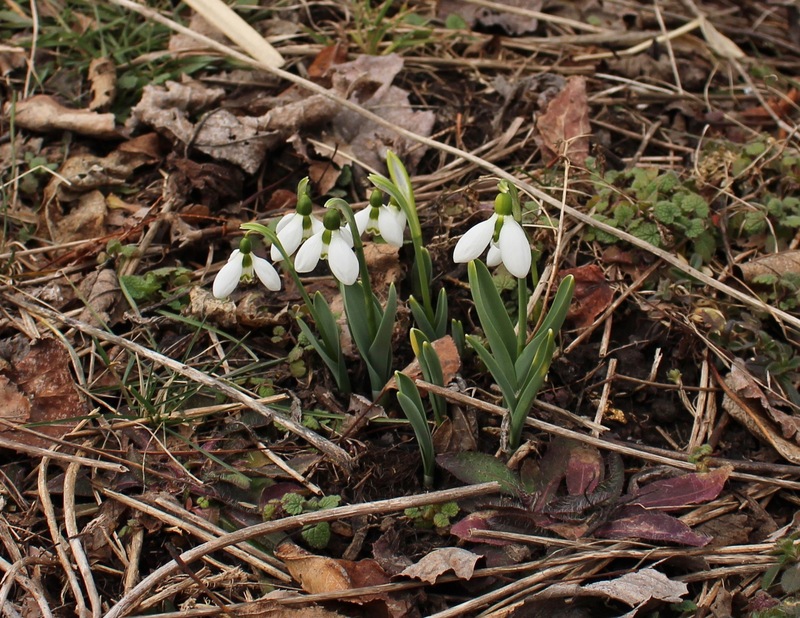 (fyi for the snowdrop nerds, word is that this snowdrop is the same as a similar one named ‘Chris Sanders’. Natalie G is now the accepted name). 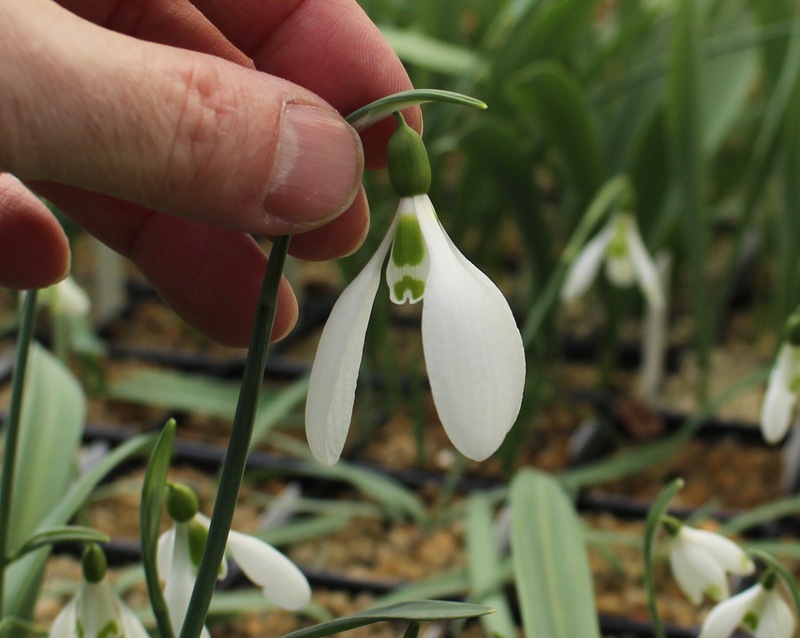 Galanthus ‘Natalie Garton’ with her extra inner petals. 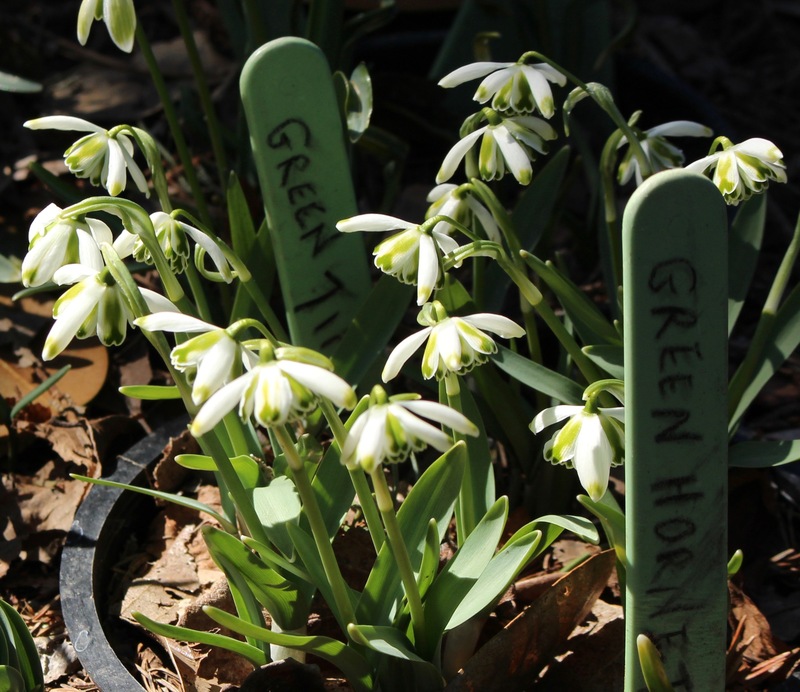 Green snowdrops are also a thing. ‘Rosemary Burnham’ is one of the classics and today she was looking fantastic. 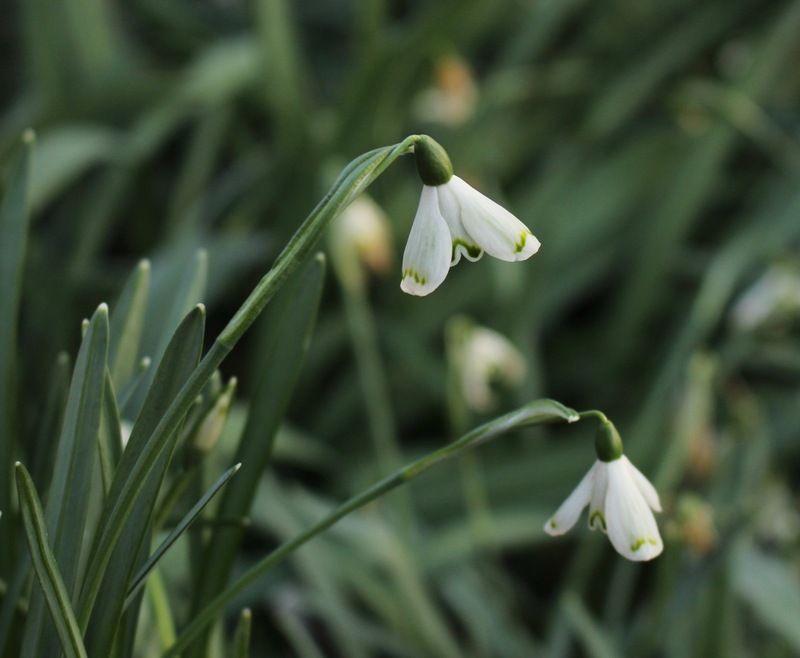 She’s a Canadian originally and as such is one of a limited number of named North American snowdrops, but her true specialness lies in the solid green wash to her outer petals. The flowers don’t jump out in the garden and are a little on the small size but I think they’re amazing. 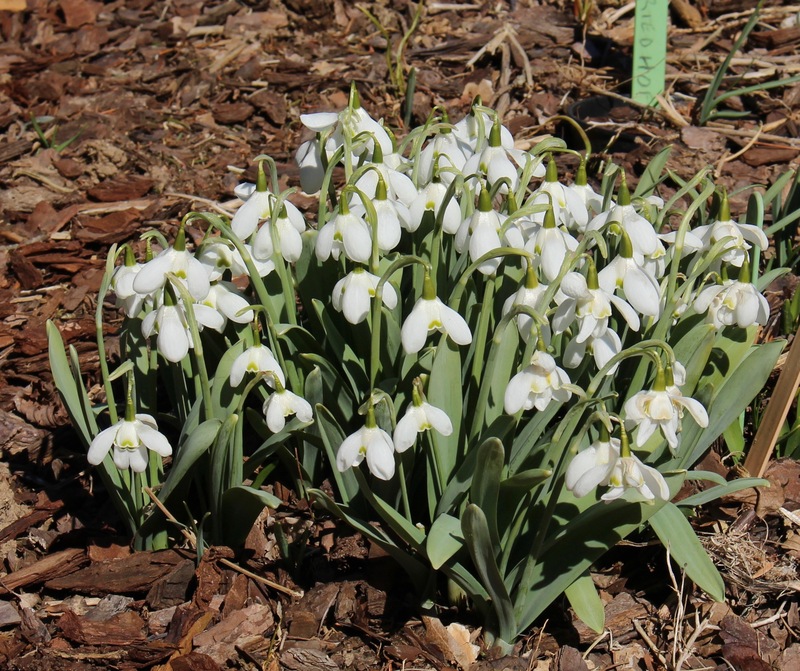 Galanthus ‘Rosemary Burnham’ looking great on her first day open. 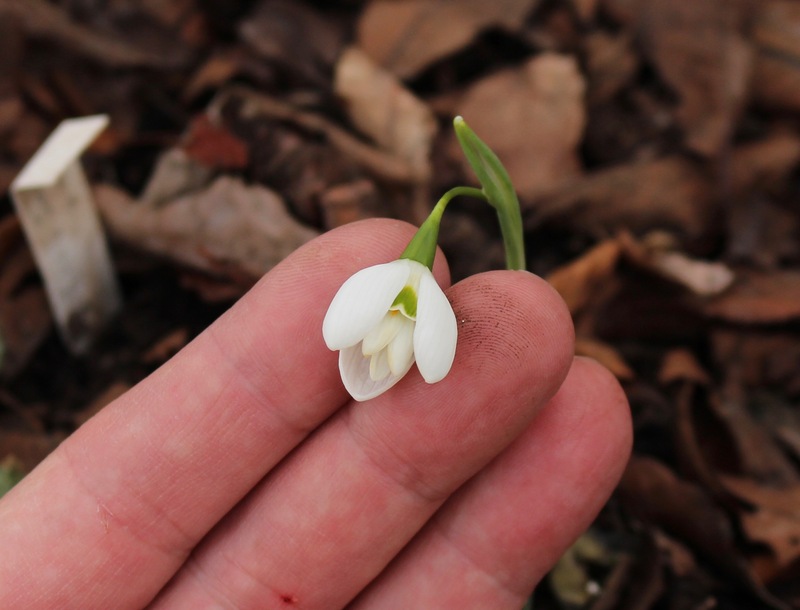 The majority of the other snowdrops are yet to come, but here’s one last plain old white one. 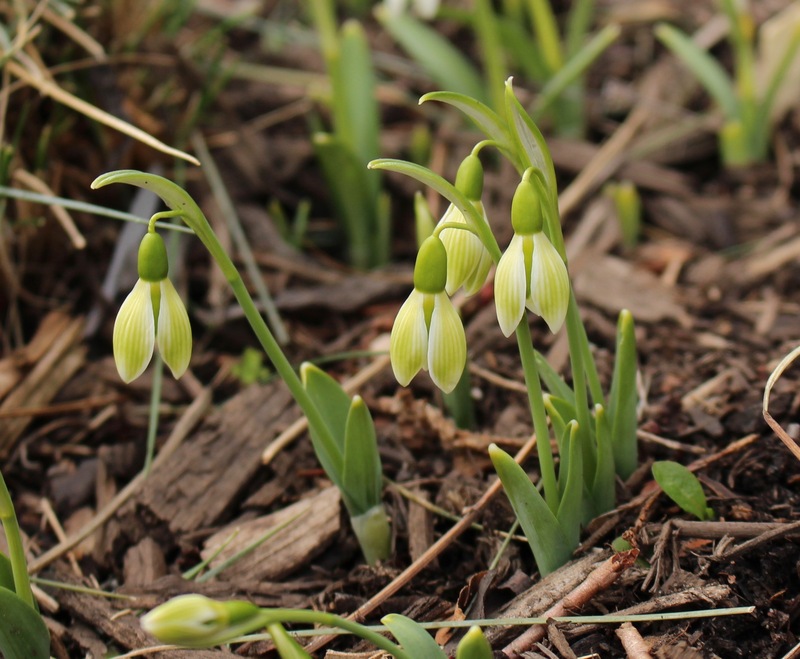 Galanthus ‘Bill Bishop’ has extra grande flowers on a short plant. Of course it’s one of the favorites. Keep your fingers crossed for a gentle ride into real spring. The last few years have been on the harsh side as far as late winter flowers go, so I promise that even if 2018 is the most exceptional snowdrop season I’ll try to control myself. 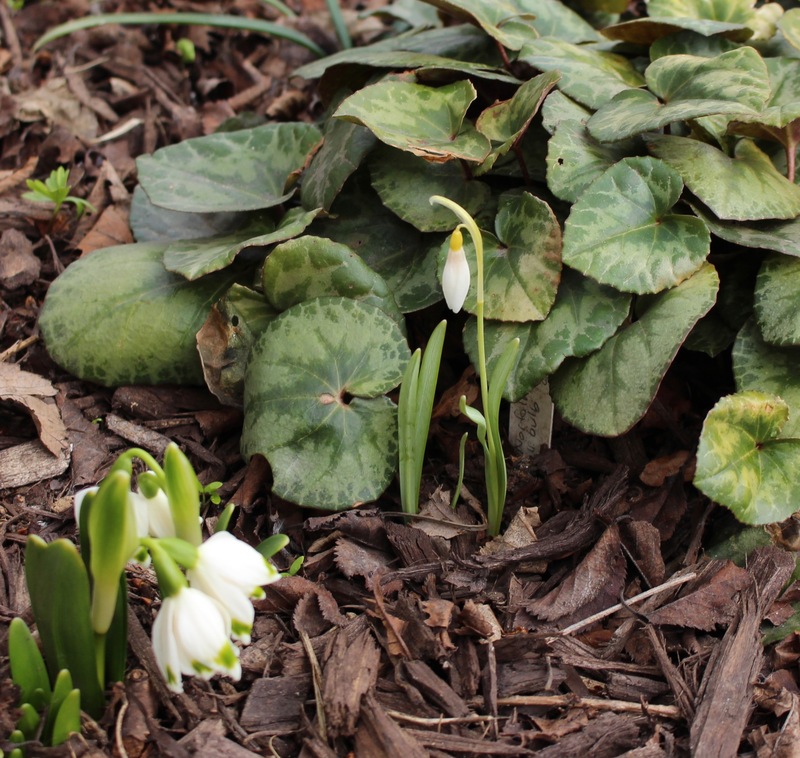 I kind of recognize that not everyone is as obsessed with these short little plants and hopefully you won’t have to resort to praying for another tornado to save you from my snowdrop overkill! 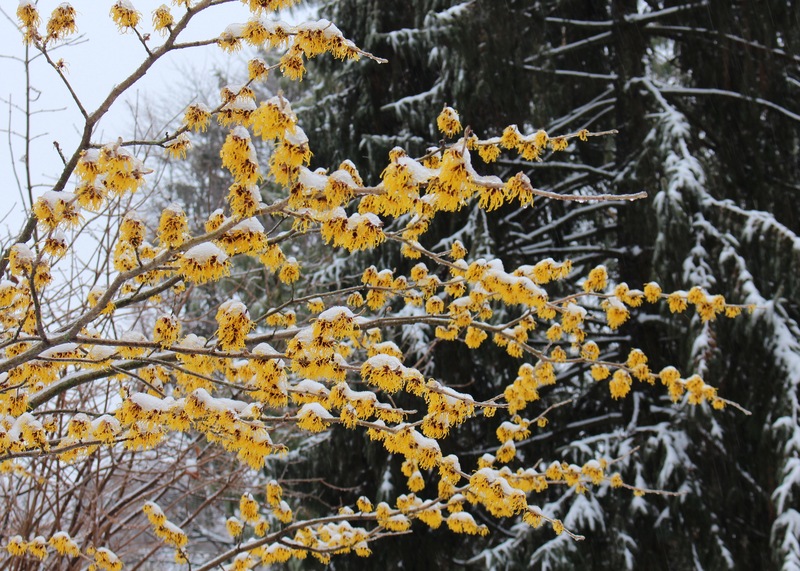 In hindsight this is the time of year when winter interest should take center stage, and the addition of conifers to the winter garden is probably the best way to keep the yard attractive during the bleakest of winter months. 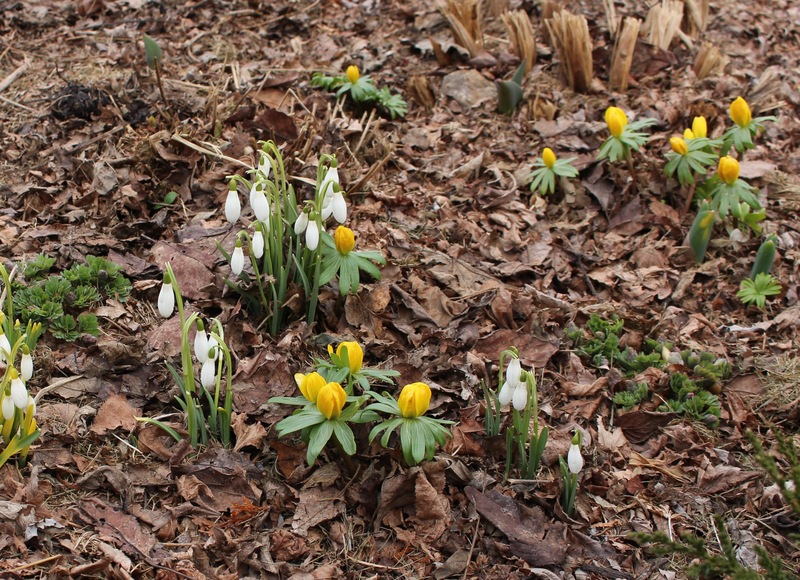 I’ve heard that and have seen it in print as well, and even the most reluctant gardener will throw a few evergreens around the house as the first step in crafting an attractive landscape. 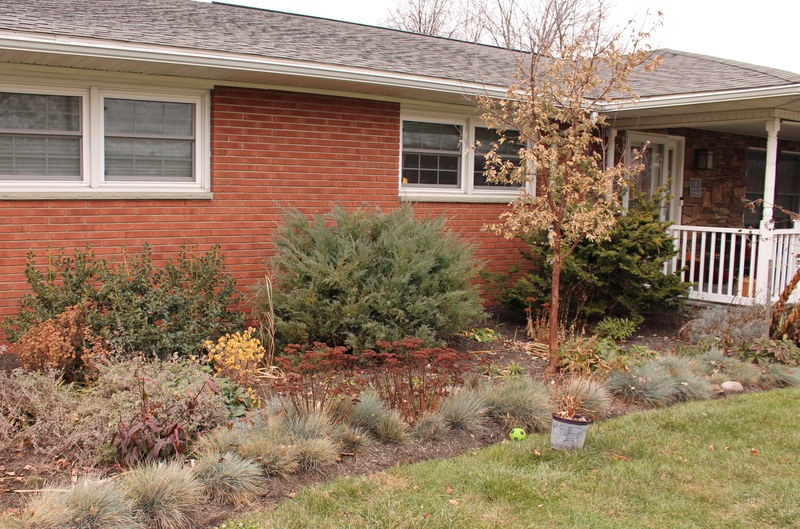 The message is out, and the majority of houses around here have a sensible foundation planting filled with neatly trimmed yews and junipers and whatever else can snuggle up to the house for year round appeal. Our own slightly less neat foundation plantings, with respectable holly, juniper, and chamaecyparis plantings lined up along the foundation. 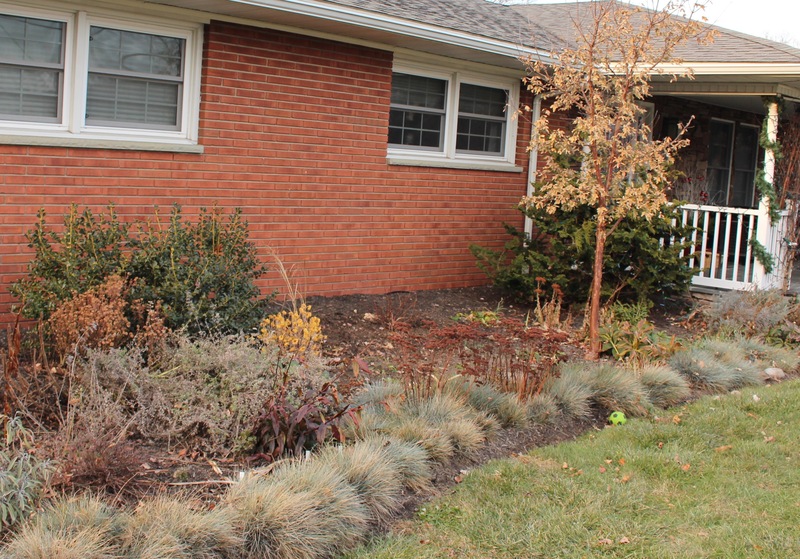 Why this gardener would chose December to remove a large juniper from a prominent front-of-the-house location is foolish enough, but to replace it with a small ninebark (Physocarpus opulifolius ‘Amber Jubilee) is over into the not so smart category. Reliable evergreen replaced with small clump of deciduous twigs… maybe you can understand that ‘uh-oh’ feeling I had as I stood there holding the saw and staring at a pile of juniper branches. If you look closely you might be able to see the newest addition to this foundation planting. It’s right there at the center of the gaping hole which was created when the juniper was removed. In all honesty I never liked the juniper. It made me itch and bored me and even though there were a thousand better things which I could be doing I suddenly needed to plant that ninebark at that minute even though I was right in the middle of putting up the Christmas lights. As long as we’re opening up here, the Christmas lights were turning into a whole other project in themselves. 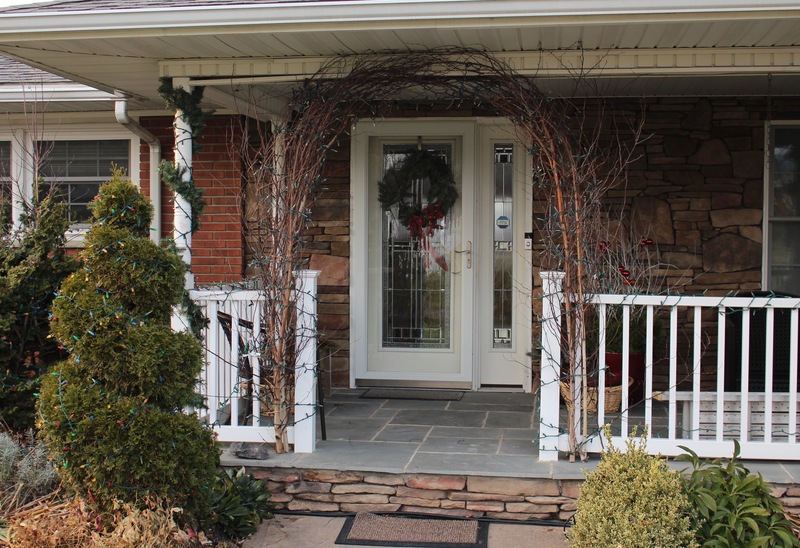 A Longwood inspired twig archway with lights. Lots of lights. The reason I had the saw out in the first place was because I needed to take a walk in the woods and cut down and drag back enough birch trees to make a decent arch leading onto the porch. I’m pretty sure a twig archway was what our holiday decorations have been lacking. 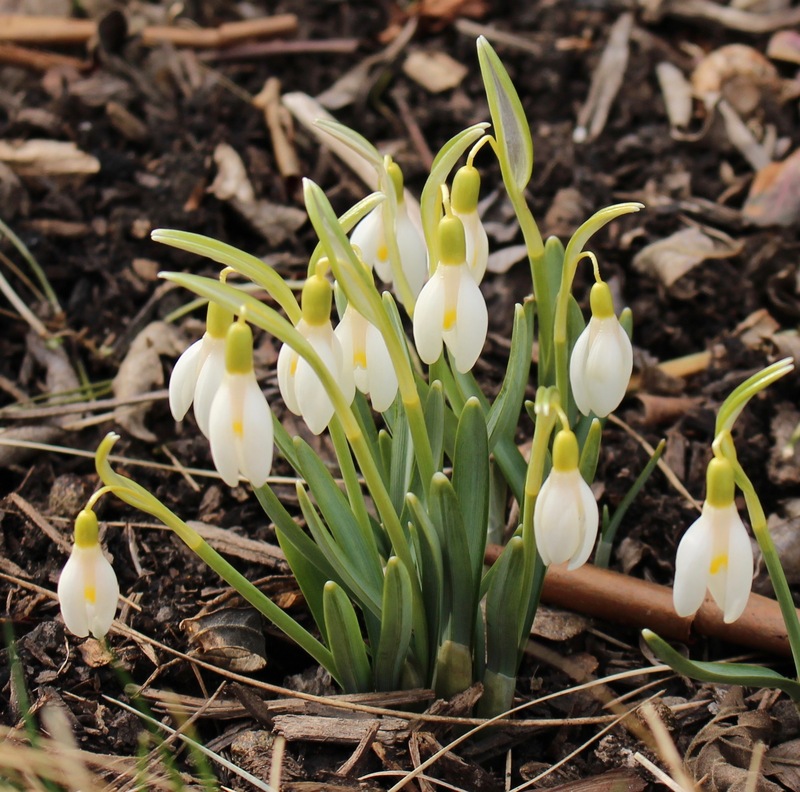 Speaking of things lacking, this blog has been lacking a snowdrop photo for months and since so many of you have been asking how the snowdrops are doing I guess it’s time to jump back into that world. Here’s a batch of fall bloomers which my friend Paula shared with me a couple years ago. They’re out on the driveway for this photo but have since moved into the garage in anticipation for the approaching cold… lows for next week show numbers around 10F (-12C) and that’s just not appropriate for such an innocent little flower… or for the box of tulip bulbs which just showed up on the doorstep this afternoon. Fall blooming giant snowdrops (Galanthus elwesii) with a nice green pattern to the inners. If pushed I’d have to admit that no one has actually asked about the snowdrops, but I’m sure they were wondering and I didn’t want to rudely ignore that. Now I’m off to check out something I can’t even ignore for a minute. 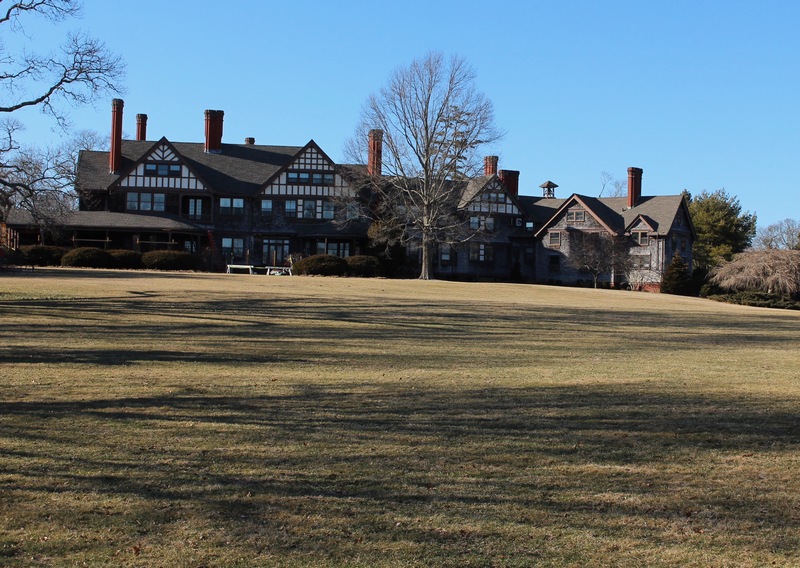 Pamela at Pam’s English Garden has put up the post detailing her own recent visit to Longwood Gardens. I knew she was there within a few days of my own visit and I’ve been looking forward to seeing her own impressions of the decorations. I hope she doesn’t point out a bunch of cool things which I missed!